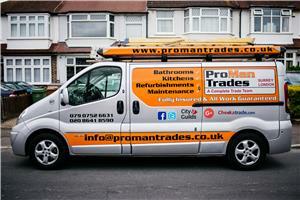 ProMan Trades Ltd - Bathrooms, Builder, Kitchens, Plumber based in Sutton, Greater London. Invoice history based on 126 reviews. Welcome to ProMan Trades- Your skilled / reliable trade team. We offer services in Building, Bathroom and Kitchen projects. Thank you for visiting our page and we look forward to your contact!